Full length native protein (purified) corresponding to Human S100 alpha. Purified S100-alpha protein from human pectoral muscle cells. Our Abpromise guarantee covers the use of ab11428 in the following tested applications. WB Use a concentration of 0.1 µg/ml. Detects a band of approximately 10 kDa (predicted molecular weight: 10 kDa). Use at a concentration of 0.1 µg/ml. Detects a band of approximately 10 kDa, representing S100-alpha from human muscle. S100 protein is relatively small and, therefore, it is recommended that the electrophoresis be performed using tricine-SDS-PAGE gels and transferred to a nylon membrane. ICC/IF image of ab11428 stained HeLa cells. The cells were 4% formaldehyde fixed (10 min) and then incubated in 1%BSA / 10% normal goat serum / 0.3M glycine in 0.1% PBS-Tween for 1h to permeabilise the cells and block non-specific protein-protein interactions. The cells were then incubated with the antibody (ab11428, 1µg/ml) overnight at +4°C. The secondary antibody (green) was Alexa Fluor® 488 goat anti-rabbit IgG (H+L) used at a 1/1000 dilution for 1h. Alexa Fluor® 594 WGA was used to label plasma membranes (red) at a 1/200 dilution for 1h. DAPI was used to stain the cell nuclei (blue) at a concentration of 1.43µM. ab11428 labelling S100 alpha (red) in HEK293T cells by Immunocytochemistry/Immunofluorescence. Cells fixed with 4% formaldehyde were permeabilized and blocked with 1X PBS containing 5% BSA and 0.3% Triton X-100 for 1 hour at room temperature. Cells were incubated with primary antibody (1:100 in blocking buffer) overnight at 4ºC. A fluorophore-conjugated goat anti-rabbit IgG (1:200) was used as the secondary antibody (1 hour at room temperature). Blue (DAPI) - nuclei. Images were taken at 40X magnification. A Western blot of S100-alpha from human ovary extract (50µg) using ab11428 at 1/1000 dilution. A secondary goat anti rabbit HRP conjugate was used to visualise. Publishing research using ab11428? Please let us know so that we can cite the reference in this datasheet. I am writing to enquire about anti-S100 alpha antibody (ab11428). On the data sheet it is stated that since S100 protein is relatively small it is recommended that the electrophoresis should be performed using tricine-SDS-PAGE gels and transferred to a nylon membrane. There should be a band of approximately 10 kDa (predicted molecular weight: 10 kDa). However, I cannot detect any bands at 10 kDa after using the anti-S100 antibody. I transfect HEK cells with pcDNA3.1+ that encodes S100A6 and lyse them with the lysis buffer (TBS, 0.1% DDM, 2mM CaCl2, protease and phosphatase inhibitors). I preform the electrophoresis on Tricine gels. Would it be possible to get more detailed protocol that you used to detect S100? Thank you for your patience. I have heard back from the lab with the following information: We used 100ug human skeletal muscle lysate which is shown on our website and we followed a standard Western blotting procedure. It is recommended that the electrophoresis to be performed using tricine-SDS-PAGE gels and transferred to a nylon membrane. Blocking can be done with 5% BSA or milk. A recommended antibody dilution is 0.1 µg/ml, but the optimal dilution needs to be determined by the enduser. As mentioned in my previous email, the main problem is most likely that S100A6 was transfected (homology only 47%) and not S100A1 (which is what the antibody was raised against). I hope this information will help you further. Please do not hesitate to contact us if you need any more advice or information. We purchased the s-100A1 antibody and applied immunohistochemical stians to kidney samples. Our results showed heterogenous expression (some neg and some positive cells) with oncocytoma renal cell carcinoma, while we had high expression with chromophobe renal cell carcinoma. The literature has shown that there is a total loss of expression with chromophobe and full expression with oncocytoma. The results seem inverted. While positive controls were normal. Has s-100A1 been applied to renal carcinomas (kidneys)? Does this seem to be a characteristic of non specific binding to another memeber of the s-100 family-or a biotin characteristic? I apologise for the delay in replying to you, the laboratory has reopened yesterday in the US because of a bank holiday on Monday. I can confirm that ab11428 has not been tested in renal carcinomas. 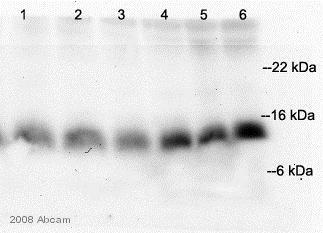 This antibody has shown no cross-reactivity with the S100-beta protein, so I do not believe the product is reacting to another form. I have browsed the resources we have available on this product and did not find any further useful information. I apologize that I could not be of further assistance. Thank you very much for your answers. I have one more question. Do both Abs (11177 & 11428) work in the WB in mouse samples? Which one works better? Specifically, since Ab11177 is monoclonal Ab, will it react with mouse although it is mentioned in you datasheet that this AB is not tested in this species? In this case, is it possible that we buy smaller amount of this Ab (for example 10~20ul) and test it in mouse sample to see whether it works or not? Thank you for your email. Ab11177 has not yet been tested for application in WB or for cross-reactivity with mouse, but ab11428 has. Therefore, I would recommend ab11428 to you. We do not routinely offer free or trial sized samples for testing purposes. Our policy at Abcam is that if an antibody does not work as specified on the datasheet, we will offer a replacement or reimbursement. Should you decide to go ahead and purchase this product, please let us know how you get on by submitting an Abreview and in return we will offer you 50 Abpoints which can be redeemed on a number of rewards (a further 100 Abpoints will be offered for an image). If you have any additional questions, please contact us again. Dear Abcam, One of our customer would like to see the image of immunohistochemistry of this antibody. If you have any information, could you send it for me via e-mail?